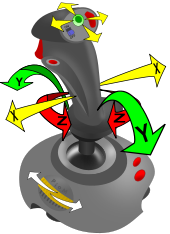 In 1997, ThrustMaster, Inc. introduced a 3D programmable controller, which was integrated into computer games to experience flight simulations. This line adapted several aspects of NASA's RHC (Rotational Hand Controller), which is used for landing and navigation methods. ^ Jamie Rigg (22 June 2012). "Joyride to Joystick: Atari Controller Custom-Built from a Car Seat Adjuster". Engadget. Retrieved 15 September 2015. ^ AFP (25 July 2009). "English Channel Armada to Mark Centenary of Louis Blériot Flight". Times of Malta. Retrieved 14 September 2015. ^ Zeller Jr., Tom (2005-06-05). "A Great Idea That's All in the Wrist". New York Times. Retrieved 2006-09-07. ^ Quinion, Michael (2004-07-17). "Questions & Answers: Joystick". World Wide Words. Retrieved 2006-09-07. ^ "A Timeline of NRL's Autonomous Systems Research" (PDF). United States Naval Research Laboratory. 2011. Retrieved 2012-10-21. ^ Mirick, C. B. (1926). "Electrical Distant Control System". United States Patent and Trademark Office. Retrieved 2012-10-21. ^ USAAF Wright Field Air Technical Service Command, T-2 Intelligence Department (1946). WF 12-105, Captured Film, 'Fritz X' German Radio-Controlled Dive Bomb (YouTube). The Digital Implosion. Event occurs at 13:45 to 15:00. Archived from the original (YouTube) on April 27, 2012. Retrieved July 24, 2013. ^ United States Office of Strategic Services (1943). WW2: Azon (1943) Radio-Controlled Dive Bomb (YouTube). The Digital Implosion. Retrieved July 21, 2013. ^ John Hutchinson (25 March 2015). "How Safe Is the Airbus A320? 'Workhorse of the Skies' Is Still One of World's Most Reliable Planes Despite Alps Crash, Say Experts". Daily Mail. Retrieved 13 September 2015. ^ Edwards, Benj (2004-07-17). "Video Games Turn Forty". 1UP.com. Retrieved 2008-05-13. ^ Grant Brunner (27 May 2013). "Shoulder Buttons of Giants: The Evolution of Controllers Leading Up to PS4 and Xbox One". ExtremeTech. Retrieved 11 September 2015. ^ "Masterpiece: The NES Advantage—God's own controller". Ars Technica. Retrieved 2018-10-02. ^ Morgan McGuire & Odest Chadwicke Jenkins (2009), Creating Games: Mechanics, Content, and Technology, A K Peters, Ltd., p. 408, ISBN 1-56881-305-8, retrieved 2011-04-03, Light guns, such as the NES Zapper or those used in the House of the Dead series, are distinctly different from positional guns used by arcade games such as SEGA's Gunblade NY. ... Light guns differ from positional guns, such as in Gunblade NY (bottom), that are essentially analog joysticks. ... Positional guns are essentially analog sticks mounted in a fixed location with respect to the screen. Light guns, in contrast, have no fixed a priori relationship with a display. ^ Yo-Sung Ho & Hyoung Joong Kim (November 13–16, 2005), Advances in Multimedia Information Processing-PCM 2005: 6th Pacific-Rim Conference on Multimedia, Jeju Island, Korea, Springer Science & Business, p. 688, ISBN 3-540-30040-6, retrieved 2011-04-03, The two routes to conventional gun control are light guns and positional guns. Light guns are the most common for video game systems of any type. They work optically with screen and do not keep track of location on the screen until the gun is fired. When the gun is fired, the screen blanks for a moment, and the optics in the gun register where on the screen the gun is aimed. That information is sent to the computer, which registers the shot. ... Positional guns are mounted stationary on the arcade cabinet with the ability to aim left/right and up/down. They function much like joysticks, which maintain a known location on screen at all times and register the current location when fired. ^ a b Peckham, Matt (September 26, 2006). "DarkStar One". SciFi.com. Archived from the original on 17 October 2006. Retrieved 2007-11-17. ^ a b "Space Interceptor: Project Freedom". MyGamer. November 9, 2004. Retrieved 2007-11-17. ^ a b Weise, Matt (May 28, 2003). "Freelancer". GameCritics. Archived from the original on January 6, 2008. Retrieved 2007-11-17. ^ a b LaMosca, Adam (July 18, 2006). "Lost in the Void". The Escapist. Retrieved 2007-11-17. ^ a b Wen, Howard (February 12, 2008). "What Happened To The Last Starfighters?". The Escapist. Retrieved 2008-06-20. ^ Hirsch, Matthew (June 4, 2017). "VPC's MongoosT-50 joystick: A rare Russian-style controller for skies or space". Ars Technica. Archived from the original on June 5, 2017. Unlike most flight sticks for sale on the US market, which tend to be based with varying levels of verisimilitude on US fighter aircraft control columns, the MongoosT-50 is built to mirror the control stick on Russian aircraft—specifically, the fifth-generation Russian Sukhoi Su-35 and PAK FA (T-50). ^ Tom Senior (7 February 2011). "Volition Would "Commit Murder" to Make Freespace 3". PC Gamer. Retrieved 29 May 2015. ^ Jonathan Drake (24 September 2011). "Nintendo 64: Launching a Legacy". IGN. Retrieved 9 September 2015. ^ 1960-, Bijlefeld, Marjolijn, (2003). It came from outer space : everyday products and ideas from the space program. Burke, Robert (Robert L.). Westport, Conn.: Greenwood Press. ISBN 0313058415. OCLC 61247073. ^ Gerry Block (December 18, 2007). "Arcade in a Box Xbox 360 Arcade Stick". IGN. Retrieved 2009-04-21. ^ "Microsoft Combat Flight Simulator 2, EU-Inside Moves Series, Jeff Van West, Book - Barnes & Noble". Search.barnesandnoble.com. Retrieved 2010-08-18. ^ Cantrell, Paul. "Helicopter Aviation". www.copters.com. Retrieved 20 December 2015. ^ Darleen Hartley (22 May 2009). "Robotics Improves Movement in Kids with Cerebral Palsy". geek.com. Retrieved 16 September 2015. ^ Andrew Liszewski (28 April 2012). "If You Don't Find This Video About Robot Wheelchairs for Babies' Heartwarming, You Probably Don't Have a Soul". Gizmodo. Retrieved 17 September 2015.